Another bonehead word problem. Notice the word “her”. While Usain Bolt holds the current 100-meter world record of 9.58 seconds, the women’s world record is currently 10.49 seconds. 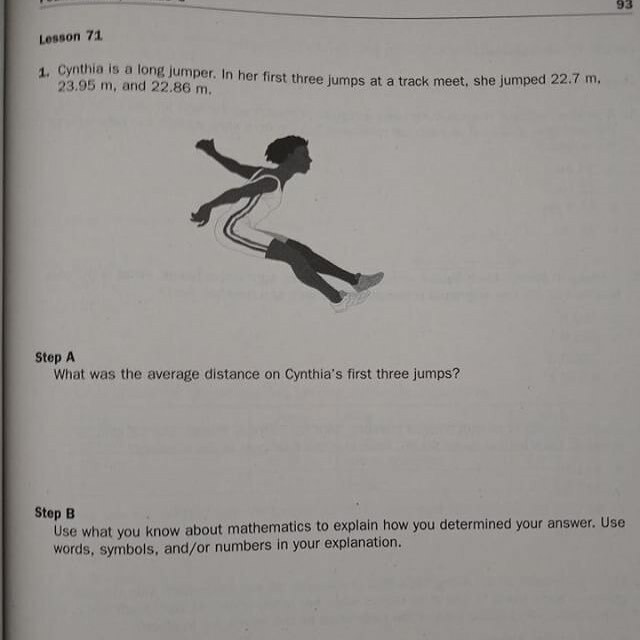 The current women’s world record for the long jump is 7.52 meters, or 24 feet, 8 inches. Why Should Physicists Study History? And a more human physics is a good thing. For starters, it makes physics more accessible, particularly for students. Many promising students drop out of the sciences because the material seems disembodied and disconnected from their lives. Science education researchers have found that those lost students “hungered—all of them—for information about how the various methods they were learning had come to be, why physicists and chemists understand nature the way they do, and what were the connections between what they were learning and the larger world.” Students can potentially lose the wonder and curiosity that drew them to science in the first place. Historical narratives naturally raise conceptual, philosophical, political, ethical, or social questions that show the importance of physics for the students’ own lives. A field in which people are acknowledged as people is much more appealing than one in which they are just calculating machines. I don’t know how to begin describing how his attempt at insulting the intelligence of one of the Love Island evictees went horribly wrong. Mixed-integer linear programming at work: finding optimal seating assignments at a wedding when everyone doesn’t necessarily get along with everyone else.